About two weeks ago I promised Anders that I would make him the perfect steak sandwich. His raised disbelieving eyebrows might have been because I am frankly not a fan of beef. I mean, I don’t get it – what is the fascination? Still, a promise is a promise so I determined that this would be the day. 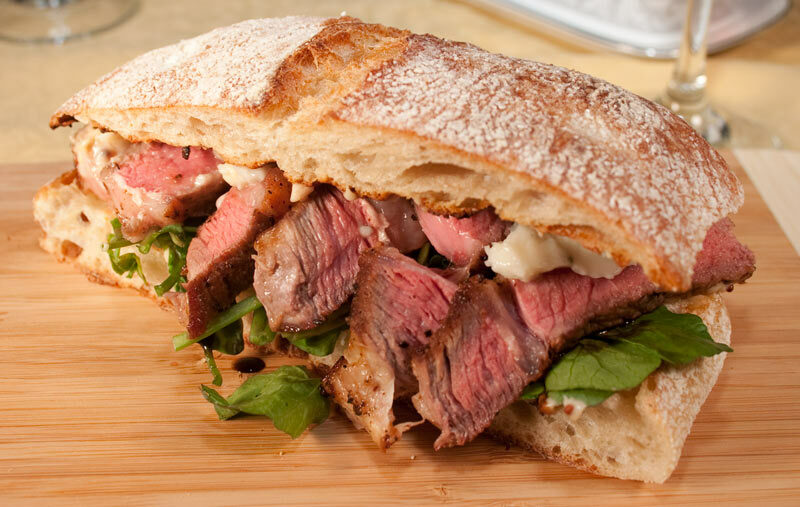 I left work with the plan in mind: rush to Trader Joe’s to buy ciabatta bread, watercress and the requisite rib-eye steak and get home and get down to business. Alas, the steaks at Trader Joes were disappointingly thin – a setback that resulted in a trip to two more supermarkets before I found the perfect steak. Two hours later, I finally made it home, tired and with some of the wind gone from my sail. Still, the look on Anders’ face when he bit into this sandwich made the evenings’ frustrations well worth it.